Well, I have sprites, but there's really not much to see. All it really is is a block of grass and a walking turnip. Constructive criticism is appreciated/wanted and I love it. So post away. I mostly modify existing sprites, this is really my first custom work. 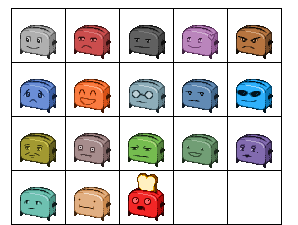 It is for my first game ever, (Not completed) "I like Toast." @Erevain: I think you need to work on your lineart (pixel placement), and coloring. I see a lot of jaggies in your character and the tile set. Most evidently the stones. Maybe working at an even smaller scale will help. Some links I gave to UnknownNormals below can probably explain it better than I can. I remember Turnip Guy a while back on the forums. Funny to see a similar concept here from a different user. Anyway, yeah, it needs a little work. I do like the grass block, it's simple, but good. I found myself doing a little edit. He's a charming character, but might I say his design is a bit weak. I feel like he should be like a Goomba, or other minor enemy/character. Generally for characters, and especially main characters, you really want them to stand out from the rest. Don't let me get you all down though; with the right setting and characterization, he would be fine as the main character of a game. I gave him a happy expression, since he seemed a bit serious. However, the seriousness is fine if you like him that way; I'm just giving some suggestions. -Stay away from pure black. It's just generally a good rule of thumb because pure black really weighs a character down, and eats away at detail for the sprite. -Contrast between tones. The white and gray you have there are not separated enough in tone to really make a noticeable change. -Animation frames don't really change apart from the leaves. For a simple step movement, it looks good, but if the player wants to move more than that, it'll look like he's gliding on the ground. Basically, it's missing the other leg going forward. -I like that you paid attention to the leaves; it shows you paying attention to detail. -Parts are separated with different colors so that it's readable. Welp, that's my two cents. Maybe a quarter. Hope it helps! @yoshirider4: Nice expressions. Very distinct from one another. @alex: Pretty sweet. I like the design. I'm awful at dithering though so I can't really offer any criticism there. The new inventory menu I've been working on for my game project. Oh, that portrait you see on the left is a placeholder and the text box on the bottom left is where the name of the currently selected command/item gets displayed. Don't be a critic on the internet while eating and drinking at your computer. Nice to see you back, Derek. Looks good! I do like the grass block, it's simple, but good. Oh, thanks! I was wondering if it was a little too simple, so it's good to hear a little positive feedback on it. I actually do like that edit. And also, thanks for the suggestions, I'll keep them in mind when I revise Turnip Man. 1. I learned a new rule of thumb! KNOWLEGDE GET! 2.I was worrying if it was a little too subtle, so I'll keep that in mind. 3. I gotcha. The edit does look nice. 5. It does? I just thought it made the leaves look shiny, but that's just me. 6. In mine or in yours? or both? Thanks for the feedback, Strasteo. I'm going to go fiddle with the stone floors now. Be he alive or be he dead, I'll grind his bones to make my bread. I am not an artist, so I don't usually like my work. But I found some art by someone named Oryx that I thought was really cool, so I based some graphics off his stuff. Its only 8x8 pixels before being resized, so its hard to keep his style without blatantly plagiarizing his work. I'm working on creating a rogue-like around this set, and progress seems to be coming along well. I hope you guys like this! I'm not happy with the walls I have, so they'll be one of the next things I work on! I think Realm of the Mad God has similar looking pixel are that is about 8x8 for many objects. But Haste is my Life. Proud member of the League of Idiotic Stencylers; doing things in Stencyl that probably shouldn't be done. Yeah, they used Oryx's art for that game. He created the art for some type of mass-collaboration where artists create art, then programmers create games based on them. Four of the top ten games from that competition used his art, including Realm of the Mad God. Are mine TOO similar? The only thing I took from him was the shape of the characters. I drew everything myself, but I did end up with some really similar designs. I'm not sure how I can differentiate them more while keeping the same style. It's hard. With 8x8 pixels it's difficult to convey something uniquely, especially if it's identical subject matter. I know that's true, Hectate. With such a small confinement in space, it's difficult to convey a message of uniqueness. I'm torn, because I've always wanted to do a fantasy rogue-like, but I'm wondering if I should change the setting so I can get away from direct copies of his work. I really like the 8x8 style, though. Also, its pretty much the extent of my artistic ability. Do what you love. If anyone comments on similarities, just tell them that you're aware of them but it's unavoidable for the reasons we discussed here.